Hello, I'm Kit Anderson. I design and create an exquisite range of contemporary ceramic tiles and hand-built pieces, decorated with original Photographic images using my unique Gum Bi-Chromate process. I have a background exhibiting as an Arts Photographer and gained my MA in Photography from De Montfort University in 2004. Drawing on this and a working life as a ceramic teacher and technician, I set up Foto Ceramica in 2006, with the aim to bring these two distinct areas of arts practice together. I had been developing ways in which to use photography with ceramics for many years and was featured in Paul Scott’s Ceramics and Print (1994, 1st Ed) for work using Photo emulsion, but was searching for a more permanent process. In 2007, Arts Council England awarded a Research and Development grant which enabled me to establish my current ceramic practice using the Gum bi-chromate process , a photography process originally used on paper which I have developed to use on bisque ceramics. I expose my original and carefully sourced archival images directly onto the ceramic surface , which is then fixed by light and fired on permanently, although the photographic image is transformed having a fragile , haunting quality. In 2012, I was very pleased to be featured again in Ceramics and Print, P Scott (3rd Ed 2012) and in Jill Enfield’s Alternative photography processes, by Focal press, where I have contributed more detailed information about my process. My work has also been featured in Magazine and online arts publications. 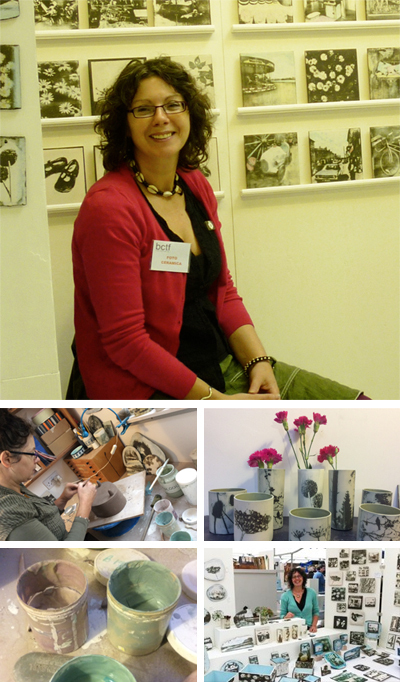 I’m a ‘fellow’ member of Design Factory since 2010, and also a member of the Northern Potters Association and associate of the Craft Potter’s Association. If you have any questions about my work or if you would like to enquirer about purchasing any of my pieces, please feel free to contact me.